Danvers, Mass. -- On an afternoon full of homecoming festivities, St. John's Prep proved unstoppable. Cole Tangney intercepted a pair of passes and Matt Crowley totaled three touchdowns as No. 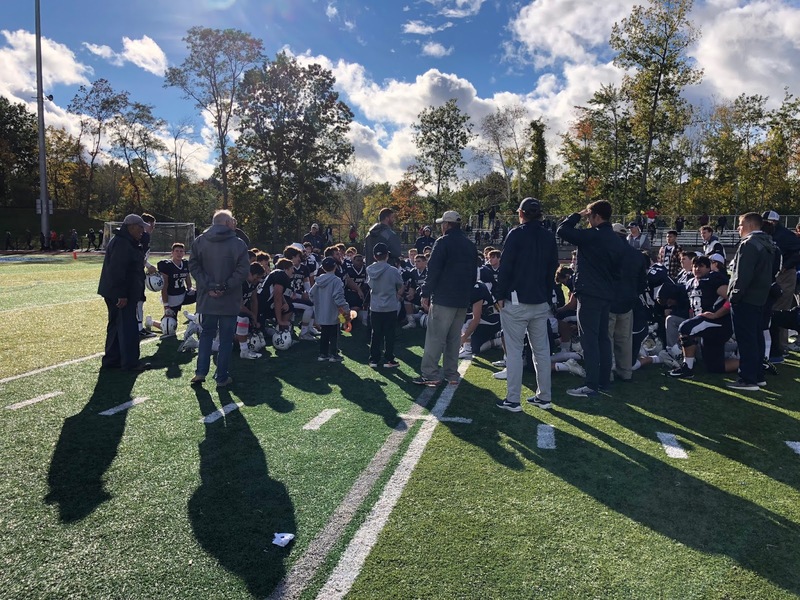 4 St. John's Prep scored 40-straight unanswered points in the first half en route to a dominating 40-19 win over BC High on Saturday afternoon at Glatz Field in Cronin Stadium. In addition to Tangney's two interceptions, Wes Rockett also added a third while the Prep defensive line comprised of John Taylor, Charlie Giunta, Collin Taylor, and Jackson Delaney combined for five first half sacks. St. John's Prep (5-1, 2-0) outgained BC High from scrimmage 221 to -14 in the first half. Kaleb Moody provided energy on the first play of the game, bringing back the opening kick-off 84 yards to put BC High up 7-0. The rest of the half belonged to the Prep. On BC High's first drive, Rockett batted a Bobby Wisenhahn pass in the air and into the arms of Tangney who returned in 38 yards for a pick-six to tie the score at seven. St. John's defensive pressure then began to take hold. A poor snap on a BC High punt attempt set up a three yard touchdown run by Aise Pream to give the St. John's Prep a 14-7 lead. Consistently throughout the first half, the Prep found itself with prime field position courtesy of its defense providing them the chance to extend the lead. A sack by Giunta pinned BC High inside their own 10, and a shanked punt gave St. John’s Prep possession at the 33-yard line. The Prep then put together their longest drive of the day, taking 10 plays to drive 33 yards, capped off by a Matt Crowley 2-yard sneak, that increased the Prep's lead to 20-7. The key play of the drive came down on third-and-11 when Crowley connected with Rockett on a 12-yard out to keep the series alive. "We're playing well, and we're bringing it during the week," said St. John's Prep coach Brian St. Pierre. "We're just trying to get better every week." The Prep's offense then turned to some trickery with halfback Trent Tully rolling right and connecting with Max Freedman in the end zone for a nine-yard touchdown to give St. John’s a 26-7 lead. “This was pretty decisive,” said St. Pierre. “Having Colton Tangney back healthy was huge. When our defensive plays like that we are very tough to go up against." The third interception of the half, this one by Rockett, set up Rockett’s own 35-yard score to put the Prep up a commanding 33-7.